In "The Godfather," Michael Corleone goes against the wishes of his family and shirks a life of organized crime. In "The Jazz Singer," Jakie Rabinowitz rejects the path of his ancestors to sing ragtime on the club circuit. Ditching the family business and striking out on your own is a well-known narrative pulling on old American themes: family obligation versus individualism, duty versus dreams. But with high youth unemployment, this story has been reversed for many young people. With no luck on the job market, many new graduates seek work a little closer to home. Or rather, in the home, with mom and dad. And for some of these young people, it's changed their life plans for the better. Adam Tannenbaum, 23, graduated from George Washington University in Spring 2009 as part of, in his words, "one of the worst classes to graduate in a quarter century." As a political junkie, Tannenbaum (pictured) sent off his resume to various D.C. political organizations. But no bites came back. After three months of unemployment and nine months at a boutique hotel chain, Tannenbaum got a call from his dad, Jeff. "Adam, there's no job market," the elder Tannenbaum told his son. "You can't keep sending resumes to people who aren't hiring and will never even give you a call to tell you 'no.' 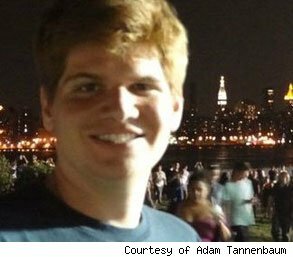 "
Tannenbaum offered his son a position at his business, Tanner Fasteners & Industrial Supplies. In 22 years, Adam had never understood the bolts, framings and fasteners that had put food on the table and paid for his college education. But with sparse opportunities on the horizon, he took the gig. While some people get disillusioned with politics by working in the field, Tannenbaum got disillusioned by escaping it. Interacting daily with ironworkers, salespeople, vendors and customers made him realize how far removed the average person was from the rhetoric inside the Beltway. "Whether or not Obama or Mitt Romney raised certain funds in a given quarter doesn't cross these people's minds," he said. While politicians will see a problem and think of a policy change, business people will see a market opportunity, Tannenbaum learned, as well as the potential to fill a real need. His accidental career in business gave him a new outlook on life. His aspirations, he says, have radically changed. As has his impression of his father, who he now sees through the eyes of the many people who do business with him. Ted Lane graduated from Connecticut College the same year as Tannenbaum, and had equally bad luck as he tried to find work at the big Wall Street firms where he'd interned over summers. "No one was finding jobs then," he explained. "And if you did, you had to have the most amazing connections." So as a jobless new graduate with a degree in economics, Lane did the natural thing: a cross-country road trip with a friend. Somewhere in Alabama he got a phone call from his mom, the founder and CEO of a midsize marketing firm. "We have a need for people who understand financial services," he remembers her saying. "So while you're looking for a job, would you like to work for me for a while?" Lane had no desire to work in marketing. But his mother offered him the flexibility to job hunt on the side, so without any other offers at that moment, he said yes. Lane soon discovered that his background in economics was a huge asset to the firm. He could translate clients' jargon into a language that his colleagues understood and used his skills to build up the financial services side of the company. "There aren't so many people in marketing that can understand a balance sheet," he said. Within five months Lane stopped interviewing elsewhere. Being the boss' son has its issues, he admits, especially since he had never studied marketing. Lane had to prove himself to his co-workers, and in conference calls and presentations, clients can still clearly see that "the person at the bottom has the same last name as the person at the top." But for Lane, the benefits outweigh the costs. He's learned that he likes the communications side of business, and is taking classes in investor relations to combine his new and old interests. Like Tannenbaum, Lane has a new respect for his parent, after seeing her in a professional context. He also gets to call mom by her first name. Most kids may not be excited to enter the family business after college, especially if it's in a field far removed from their line of study. A lot of parents may not be so excited either. But for some new graduates, it's an experience that has reshaped the way they view mom and dad, and their own life plans. Next:Are Internships The Golden Ticket Out Of The Recession?